The continued growth of the re-release market brings to light performances – some well-known, some less so – that not only give a glimpse of performance practice of their time but, as in this case, show quite how willing, in the hey-day of the LP and CD, labels were to record and re-record particular pillars of the repertory. 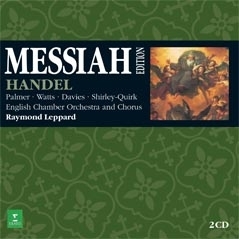 It's a measure of Handel's fame, and particularly that of the Messiah, that Warner are able to dedicate a whole 'edition' to recordings of the work from their own back-catalogue (recorded originally by Erato and Teldec). It's definitely one of the more unusual initiatives to be thought up by the record companies in this anniversary year, but a fascinating one nonetheless. Now re-released on convenient double CD, sets once treasured on LP, such as some of these Messiahs, can finally be bought cheaply enough so that one can justify the minor expense rather than mess around with home digital transfer software to bring them onto a more convenient format. Inevitably with convenient, budget reissues one not only loses the tactile appeal of the original but, as in the case here, the often extensive original documentation and sleeve notes. All we have here, then, is a generic essay by David Cairns duplicated throughout the four Handel discs, leaving only the Mozart version to boast its own notes by Jérôme Pléssier. 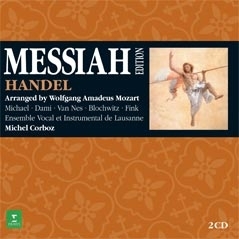 It is easy to forget that Mozart's revision, made less than fifty years after Handel's original composition, was for a long time the main version of The Messiah that was published and performed across Europe. Indeed, Handel'sown scores weren't really given much consideration until Chrysander's edition in the late nineteenth century. Mozart arranged the oratorio with an enormous sensitivity and sympathy reflecting his admiration and respect for Handel without changing the sentiment or the structure of the work. His was simply an updating of style. Michel Corboz's recording with the Ensemble Instrumental de Lausanne comes highly recommended since it is light, nimble and has a close affinity with Historically Informed Performances as we have come to know them. This Mozart arrangement is pleasingly warm especially in some of the solos like 'O Du, die Wonne' (O Thou that tallest) which has much more orchestral involvement such as motifs from various wind instruments curling around the soloists adding an extra level of delight. The soloists are particularly good too, Hans Peter Blochwitz (tenor) and Marcos Fink (bass) are commanding without loosing any of the Baroque agility that Mozart still requires, Jard van Nes (alto) is deeply rich and possibly rather 'old school' for modern tastes but I love her voice as I do Audrey Michel (soprano I) and the lighter Magali Dami (soprano II) – but it's frustrating that the CD notes don't tell more about the instrumentalists, the pitch, the size of the choir, or much of that sort of thing. Of the four Handel recordings Yehudi Menuhin's performance with the Kaunas State Choir and Lithuanian Chamber Orchestra is possibly the most 'old-school' of the group for it echoes something of romantic grandeur and not just because of the orchestral instruments. There are great sweeping phrases that would these days be far more gestural and Menuhin is prone to some rather pedantic mood changes that can seem a bit like spoon-feeding the audience. Despite these points he can never be accused of dullness as this performance is full of excitement and even some tempi which are zippy even by current standards. Far from being the oldest it was recorded in 1996 at the Rheingau Musik Festival just a few years before he died. It is a shame that this performance is marred by such heavily inflected English pronunciation right from the start when Algirdas Janutas (tenor) struggles to get the 'm' in 'Comfort ye' several times in a row. Liliana Bizineche-Eisinger (alto) then struggles with her 'r's in 'but who may abide' since she manages to over-roll them in 'appeareth' and 'For he is like a refiners fire'. Thankfully this isn't the case with Benno Schollum (Bass) or Susan Roberts (Soprano) although the thrill of her four soprano recitatives in Part One is somewhat overshadowed by a rather nasty harpsichord tone followed by 'and peace on eyurrrth' from the chorus, however, she gets much more of a platform in 'How beautiful are the feet' which I found very attractive and engaging. The genius of Menuhin's musicality and the sheer dramatic excitement of this recording ought not to be overshadowed by such pronunciation and I'm sure that with repeated listening a little familiarity would help to desensitize the listener but it is an issue throughout this disc because these warped vowels resonate in a different way imbuing the music with a host of unexpected (and unwanted?) hues. It's shame – but a fascinating shame nonetheless. Raymond Leppard's 1974 recording is a real treat as it still sounds so astonishingly fresh, partly due no doubt to some clever remastering. Leppard did much to popularize 17th and 18th century music with his English Chamber Orchestra but they are not a period instrument band even though their style is greatly influenced by the baroque and classical music they played. 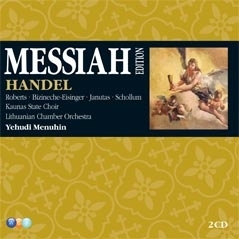 In this Messiah the modern instruments do a lot to balance the big-voiced soloists and the result is actually very pleasing. Underpinning the whole performance is Leppard's own harpsichord playing (and presumably his realization of the organ part too) which is perky and often quite witty. Ryland Davies (tenor) so commanding in his opening arias sounds slightly thrown in his air 'Their sound is gone out' by some of this realization going on underneath him. The chorus 'All we like sheep' has a particularly cute organ part that sums up the humour and joy in music-making that Leppard always conveys. Of the other soloists, Felicity Palmer (soprano), Helen Watts (alto) and John Shirley-Quirk (bass), the ladies sound the most dated since it is the soprano and alto sound (sopranos in particular) that has changed so much over the course of the past few decades with Historically Informed Performance. This is, however, a fantastic recording with lots of interest and commitment and some excellent singing from the English Chamber Chorus (director: Terry Edwards). Nikolaus Harnoncourt's 1982 recording with Concentus musicus Wien is one of the two in this selection to use a period orchestra. Immediately one is in a different sound-world where cleaner lines and a more brittle string tone are the dominant factor. I was really looking forward to this recording above all the others but it turned out to be a slight disappointment. Recorded live over two performances, Harnoncourt sets some surprisingly ponderous tempi, and has a mixed bag of soloists the best of which is the soprano Elizabeth Gale. The bass, Roderick Kennedy, certainly has presence but feels too heavy compared to the others, as if he alone is in an opera –eclipsing the orchestra sometimes and actually not making too pleasant a sound at other times. English accents are again inflected from Marjana Lipovsek (alto) and, less so, Werner Hollweg (tenor). Unfortunately Lipovsek makes some rather clunky gear-changes in 'But who may abide' without which the aria could have been be quite exciting. The choruses, however, are really good. Even in the frustratingly slow 'And he shall purify' they really give a sense of commitment to the text and joy where appropriate. This is a deeply interesting Messiah from an important conductor illustrating how crucial the balance of period style and gut instinct is to the success of a performance. Too much of this album feels controlled or held-back which distracts from some of the beautiful singing and instrumental playing. Ton Koopman's 1983 recording with The Sixteen and Amsterdam Baroque was my clear favourite of these four Handel albums. Firstly, I like the orchestral playing and, in particular, the string sound that Koopman coaxes from his players. Unlike Harnoncourt's band, it never feels overly preened or self-conscious. Secondly his soloists are superior – not only is this the only performance considered here to use a countertenor (James Bowman) but there is also an English tenor (Paul Elliot) and an excellent chorus (The Sixteen). Elliot might be too light for some tastes, but I love his gentle tone and find his delicate ornaments really persuasive – even though I wouldn't say no to some more drama from him. Bowman characteristically conveys a great sense of storytelling and some really beautiful high notes in 'Thou art gone up on high' but it is a shame that he is denied 'But who may abide' as Gregory Reinhart (Bass) is a little too slick and so it lacks the excitement of a countertenor's high range. Marjanne Kweksilber (soprano) is the only odd choice as her voice is such a different style to the others and consequently her vibrato sounds like nervous disorder by comparison, especially in 'Thy rebuke' and 'Behold and see'; 'I know that my redeemer', with it's delicious long phrases, suits her much better. The real stars of this disc though are The Sixteen. Still a reasonably young group at this point and full of singers who went on to have major careers in early music, they are crisp, responsive and very clear with the text. 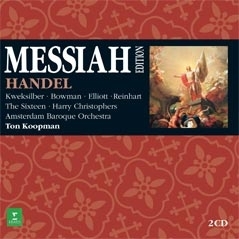 The Messiah is lost when the choruses are below standard and Ton Koopman's recording delivers the most excellent choral sound throughout. I love the intimate sound of his early instruments combined with The Sixteen and, of course, Bowman's exciting arias. These five re-releases offer much food for thought and some important snapshots of performing practices throughout the middle stages of the early music revival. Everyone should find a Messiah to suit his or her tastes in this little selection and at an attractive price too.